Looking for a function room in Liverpool for your club or society? 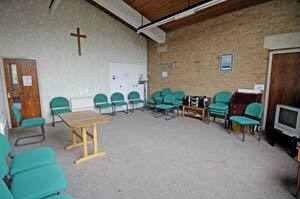 A cost effective venue for a business meeting or conference? Somewhere for a children’s party? We have the ideal function room for you, conveniently located close to the end of the M62 with good public transport links and on site parking for 40+ cars. The majority of facilities including toilets are fully wheelchair accessible. Hall Hire: 5 Great Function Rooms. 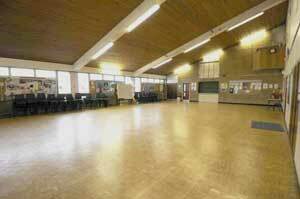 This is a large general purpose hall with wooden parquet flooring. It has a fully equipped kitchen with a serving counter that opens onto the hall itself. Sturdy tables and chairs are available. This room does not have a dedicated P.A. system but a professional quality amplifier and stereo speaker system can be provided if required. Headroom: roughly 3m (10ft) rising to 7m (24ft) along the short wall of the hall. Capacity depends on use, but the hall will typically accomodate a maximum of 150 people and has sufficient seating for 130 people. £40 for up to 2 hours, then £10 for each additional hour or part thereof. Click here to request more information or to enquire about availability. A smaller rectangular room (roughly 5×12 metres) with wooden flooring. It is situated in between the main church hall and the church itself. 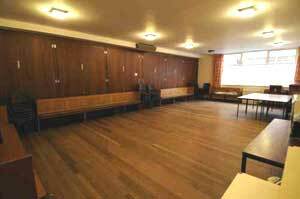 One side of the room is a partition (shown on the photo) that can be pulled back to turn this room into an extension of the main church. Parlour Hire Rates: £30 for up to 2 hours, then £10 for each additional hour or part thereof. The church itself (known as the Sanctuary) may be hired if the intended usage is appropriate. It is a flexible performance space with low level stage, P.A. with inductive loop and seating for approx. 120 persons. This can be extended to approx. 190 by retracting a partition wall that separates the church from the parlour. Seating is on solid, comfortable padded chairs that can be rearranged as required and the room is carpeted throughout. Note: The stage in church is a simple raised platform, not a fully featured theatrical stage. 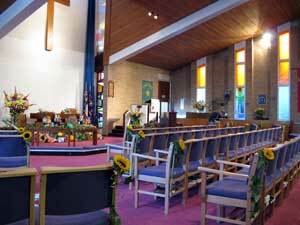 Sanctuary (Main Church) Hire Rates: £40 for up to 2 hours, then £10 for each additional hour or part thereof. A more intimate room, suitable for up to 30 persons. Good natural light during the day as one wall is almost entirely taken up by a north-facing window overlooking Roby Road. Also features a small balcony that overlooks the main hall (behind the normally-locked door visible on the right hand side of the photo). Another room suitable for up to 30 persons. Similar to upstairs room 1 but with hard flooring rather than carpet and this room does not feature the large window or balcony overlooking the main hall. Hire Rates for upstairs rooms: £30 for up to 2 hours, then £10 for each additional hour or part thereof. As our function rooms are inside a Methodist church building, the intended usage for all bookings is subject to approval, though we’re not about to stop you having fun of course! The majority of uses are OK. You want to put up a bouncy castle inside the main hall? That would be fine, but there are a few things that aren’t appropriate in a venue like ours. For example, the consumption of alcohol, gambling and (for insurance reasons) anything that goes on after 10pm. Full details on the “do’s & don’ts” page. To check whether your event is suitable for our venue, contact us and let us know what you’ve got planned.